Operation Thailand: You Pay Now! 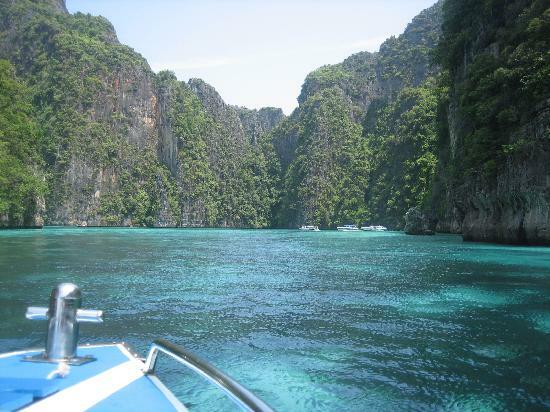 Last one was getting a little long so still on the magical bus ride so will let you know how the rest of Phi Phi was. After diving, met up with Kait, Stu, Karen, Scott, Ian and Alex. Ian is Stu's brother and Alex is his gf. A bunch of Canadians hanging out on a Thai island. Not complaining. First 2 days rained a bit, had a few small rivers to walk through on the way into the busier part of town but nothing me and my flippy floppies couldn't handle. First night, watched a fire show, not surprisingly. oh and did something else that I will talk about later but needs to be a secret for maybe a month. Then will discuss. Ate some great pizza, had a bucket or two, saw a small Thai teenager pick a fight with a bigger non Thai person, definitely didn't know that the kid was into Muay Thai, went to see what happened, the non Thai guy was knocked out on the beach and the teenager was kicking him in the shins until his friends stepped it. Lesson: Don't fight locals. Next day it was raining so I slepped in, met up with everyone, they went swimming, I stayed dry and lifeguarded them. Ate supper at this Italian restuarant, very good. Even though I really like Subway, eating supper with friends at a nice restaurant beats it hands down. Not 100% sure what the quote is but been thinking about it lately. It doesn't matter where you go in life, it matters who you have beside you. I think it is very true. Watched another fire show from people who were on Thailand's got Talent. Best show I've seen. After that, well first let me say that I do like dancing. Just certain conditions need to be present. 1-Maybe a drink or two. Not drunk just something to losen you up. 2-Music you like and music you can dance to. 3-Having people you like aroiund you. All three of those things were present, we were outside, warm night, on the beach and had a DJ from Samui there would had incredible remixes and had the best dancing session of my life. I really needed to let it out before my Northern Thailand journey started and I got exactly what I needed so Teacher Bert was happy. Oh and the other night we watched Muay Thai, which was on my Tland bucket list. Then, they let random people come up and fight and they get a free bucket to entertain the masses. And it was entertaining, might have lost a hundred baht to Stu because the color Red wasn't aggresive enough. After that, went to Long Beach where I did not double check ferry times and had to stay an extra night. Not the worst thing to be stuck here. But left my mom solo which she apparently used for walking around Bangkok unsupervised and sleeping. Karen and Scott went home this morning, love them and will definitly be hanging out with them in Ottawa, possible at the cabin. Karen has a bunch of group pictures so once I get some, they will be posted on my fb and here. Hung out on the beach this morning, did a little snorkelling, oh and yesterday did a snorkeling trip around Maya Beach where the movie The Beach was filmed. on Loh Sama. Either way, not bad. Way less people, great swimming and beautiful cliffs. I'd rate Phi Phi a 17.8 out of 21 on the Bertron Tourist Scale. Anyway, that's what I've been up to, every day I get a little more excited to see Mother Goose so should be a good 2 weeks.